From my initial viewing of the Wildlife trailer, I knew there were some major pieces being left out. I felt deprived of having any real sense of what the movie would entail, let alone carry an impression of what to expect. The trailer was rather reserved and too undeserving of what I knew this movie was capable of. I decided to see this film to test my intuition. To my surprise, this film was what I would call “messy.” Messy as in, countless rounds of drama and unexpected events. This film undoubtedly had a punch to it, something that you wouldn’t necessarily expect. 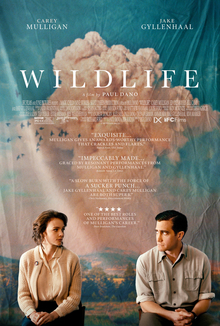 Wildlife is adapted from a novel by Richard Ford and takes place in 1960 in a small, lonely town in Montana. From the beginning, we’re made to believe that they are living in a typical, happy life that is contained within a small town. It seems to be a cheesy story revolving a father who is a pro golfer, a submissive housewife, and a young teenage boy who appears to be naive to family happiness. Though, it did not take Dano (Director) long to submerge this fake sense of family solidarity. Jerry (Jake Gyllenhaal) loses his job, from what he believes is due to him being “too well-liked” and “too personable”. This immediately gives an insight of Jeanette (Carey Mulligan) and Joe’s (Ed Oxenbould) passive reservations toward their father’s job insecurity leading to multiple reallocations. To make matters worse, Jerry is offered his job back, but he declines, for he “will not work for people like that.” To step up, Jeanette suggests that she go back to work to support the family, but without throwing it in Jerry’s face in such a way that would threaten his manhood. Even little Joe chimed in to suggest picking up a part-time job after school. Despite Jerry’s negativity toward receiving extra help, he decides to take a job for $1.00/hour fighting forest fires up north. Not only is this life-threatening and under-compensating for such, but he would be leaving Jeanette and Joe to fend for themselves back at home. This news was the snapping point of Jeanette. Throughout her anger and frustration, it seemed like she was being portrayed as an unstable woman unsure of her wants. To emphasize this perspective, the film is actually told by Joe’s point-of-view. This leads to even more confusion of feelings that are expressed by the adults in question. Jeanette puts Joe in countless uncomfortable situations. He’s immediately told that his father must be cheating on his mother. Jeanette’s explanation to Joe is: “Why do you think men do things? They’re either crazy or it’s a woman. Or both.” From Joe’s point-of-view, the audience is indulged into this divided realm between the parents, and where that leaves Joe to figure things out on his own. Out of spite (and for financial security), Jeanette turns to one of her swimming students, Warren Miller, for more reasons that she is able to articulate. To make everything even more complex and uneasy for Joe, Jeanette becomes nothing more than a drunk, submissive woman during dinner at Mr. Miller’s house. All of which was witnessed by Joe, followed by another sensual evening spent in their own home. For this story to have taken place in 1960, it’s extremely important to note the film’s stance on feminism and coming-of-age. The underlying of this film is simply put: a damaged family falling victim to the failures of the provider, a young teen who is forced to step up and see the undesirable truth, and an (arguably) uncertain woman who doesn’t need a man to complete her. Interestingly enough, in 1963, The Feminine Mystique was published by Betty Friedan. This book is highly credited for its contributions to sparking the second wave of feminism in the United States. Friedan focuses on explaining the way women behave in the US society. She argued that the preconceptions of domestic womanhood consequently led to identity crises for American women, much of what was seen from Jeanette in Wildlife.